Colouring Wordsearch Book - The worlds first colouring wordsearch book! The worlds first wordsearch colouring book! 35 puzzles with 35 corresponding word art pages. 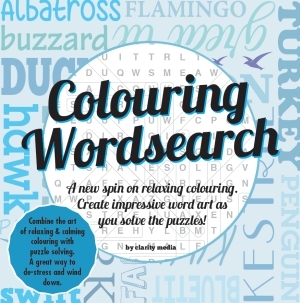 Welcome to this fantastic collection of colouring wordsearch, a new way to ease the stress of daily life. This book will provide hours of relaxing fun, enabling you to wind down and solve the themed puzzles whilst creating eye-catching artwork. 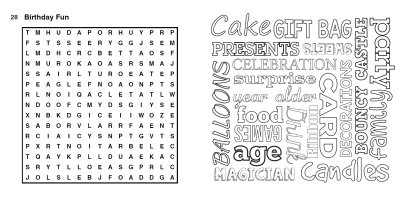 Our puzzles have a unique word list which is displayed on the opposite page to the grid. These pages feature all the words you need to find, so after every word is located and circled, you can colour the text in. Recent trends have shown that adult colouring is not only incredibly enjoyable, but very calming. Here you can combine two great stress busters that are sure to bring you hours of fun. Puzzles and word-art pages are displayed in an attractive 8.5x8.5 inch book, so there is plenty of room for colouring and the font size in the puzzle grids is a huge 18pt large print size.